Tech Tues: Going green never sounded so good. 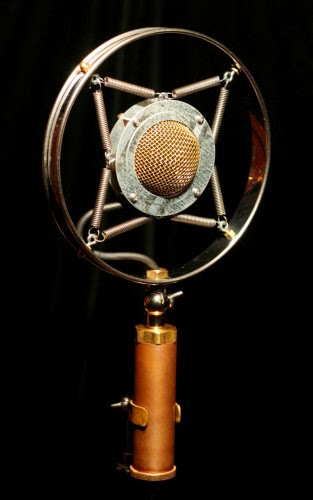 Myrtle is the latest handcrafted microphone from Ear Trumpet Labs. It has the look of a vintage broadcast microphone and if their other microphones are any indication of sound quality, I'm sure Myrtle offers impeccable sound. Ear Trumpet Labs is based in Portland, Oregon and specializes in making great sounding microphones by hand from everyday objects and common hardware. The microphones work well in the studio or at live shows. "Myrtle is stunning sounding and a visual treat. A perfect live mic for old-school stage vocal technique, she's tuned to sound ideal from three inches to a foot away. She has a natural warmth of tone and crisp clarity that combine to make an extraordinarily natural sounding live mic. Cardioid pickup pattern (directional) with great rejection of off-pattern sound and integrated pop filter makes for easy use in a live mix." Hand made microphone with the looks of classic early broadcast mics. Unique headbasket with eight-spring suspension. Internal multilayer silk pop filter, for plosive protection without sacrificing clarity. Read reviews of their Edwina microphone on Sound and Sound and TapeOp. Here are some videos of Ear Trumpet Labs Microphones including a short of owner Philip Graham showing the philosophy behind their design. There's many more videos to be found on their gallery page. I'm adding the Myrtle to my Christmas list.